We are dedicated to family engagement, positive behavior guidance, and innovation to support the social-emotional development of every child we serve. 2:00-3:15PM Arrival Play in the gym, the computer lab, or outside during arrival! 3:15-3:30PM Snack Eat a free nutritious snack and talk about your day. 3:40-4:20PM Homework Get one on one homework help with a volunteer & play classroom games. 4:30-5:20PM Electives Choose from over 15 electives! 5:30-6:00PM Departure Socialize with your friends, play some basketball, or play games in our Tech Lab before you leave! We use the Nurtured Heart Approach, which is designed to guide children in the most positive way possible. Our goal is for children to learn from their mistakes, to take ownership of their actions, and to develop their social-emotional and problem solving skills. 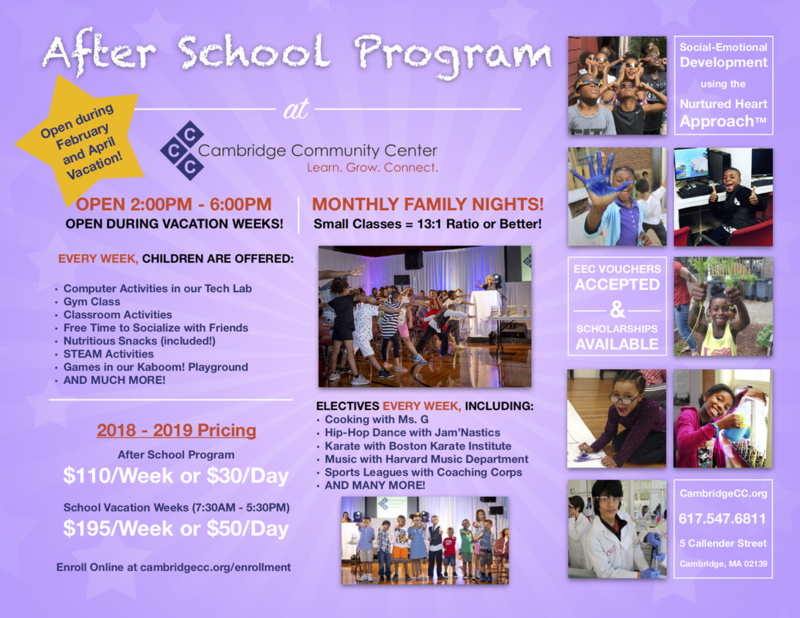 ​The Cambridge Community Center is not a homework center. Children are given the opportunity to work on their homework from 3:40-4:20. In most cases, we are able to provide one-on-one homework support during this time. We are dedicated to enrolling not only children, but families. Group leaders update parents every week and help plan monthly Family Nights. The first Friday of every month is Family Night, where all of our families are invited to eat dinner and socialize with staff and other families. Past family nights have included decorating gingerbread houses, movie nights, and collage making!